Replying that the federal government has no jurisdiction over the killing of African Americans by a mob in Winston-Salem, NC. Your letter of the 21st instant to the President complaining of the killing of certain negroes by a mob at Winston-Salem, North Carolina, has been referred to this Department. In reply you are advised that the Supreme Court of the United States in the case of Hodges v. United States, 203 U. S. 1, decided that the Federal Government had no jurisdiction under the Constitution over offenses of this character. 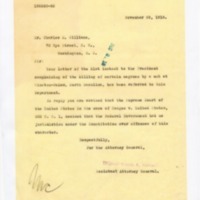 Porter, Claude R., “Claude R. Porter to Charles M. Williams ,” 1918 November 29, TI00253d, Race and Segregation Collection, Woodrow Wilson Presidential Library & Museum, Staunton, Virginia.